Daycare: T-6 days – daddy and baby at home – a running descent into madness? Today looks to be less interesting, but I figured I would go ahead and attempt to chronicle the trials and tribulations of a stay-at-home-dad this week. It’s pretty amazing what one can do when one has an uninterrupted lunch hour or few minutes after work to get something done, I realize this now. I don’t have this time. The day starts somewhere around 5am with the crib midget fidget, it means she’s hungry, wet diaper, gassy, sleepy, cranky, and sweaty usually. Today was no exception. Fed her two ounces of formula, popped the baby cork back in her, and drifted off to sleep…. is how this should have read… but actually I ended up getting comfy and then hearing pig-like noises coming out of the bassinet and saw that two ounces of formula was not enough for my munchkin today, she needed a full four. That done I lifted the sweaty beast and did my first diaper change while the child was still asleep. That was novel. We’ll see how this day of daddy and baby at home goes. 7:10 decide to make eggs sunny side up, fresh ground coffee, Eggos. Breakfast of champions. I keep stopping every couple of minutes to listen to see if baby is freaking out and let Kim sleep a bit longer. 7:30 everything’s prepared, no noise. Sit down to eat. 7:31 at one bite into my food I hear a plaintive wailing coming from upstairs. Baby M has begun her day. 7:34 in a combo of being mean and being practical, I eat my breakfast in front of the baby who is fascinated by my eating, I tell her that someday this can be hers but she’s going to have to do some tummy time/rollovers before this will happen. 11:38 attempt to turn into WalMart, prostitute dashes in front of car followed by man with walker getting stuck in the middle of the road because he couldn’t figure out how to walk forward any more. Very odd situation. 11:48 after stopping at Regions in parking lot, park pretty far out near no cars so I can load up a lawnmower, homeless woman/meth head by the looks of it darts for me and says “how are you doing” and with my baby in hand I say “we’re doing just great, thank you for asking, not too many people approach a guy wearing a wolf shirt and badge while holding an infant how they’re doing.” She keeps walking. oh wait, I’m not wearing a badge… oh well… I don’t talk to meth heads while packing baby. 11:55 there are no lawnmowers at the Wal-Mart… served me right for going there in the first place. 12:33 at Lowes, find the mowers I need. Can’t find a flat cart and can’t fit two mowers in a cart. 12:40 after searching for a while, finally find a flat cart and transfer Maggie to it. 12:48 picked up a couple of lawn mowers for the rentals, they ask if I want help loading them, I say yes. I load up Maggie and pull around for help and none comes. 12:52 baby overheating, I walk in with Maggie and grab the cart myself, load them up, dude comes out finally and asks if i need help. 1:20 after hearing Baby M is lagging behind on tummy time, I get her accustomed to it by hugging her and laying back, she hangs out on me on her tummy for about 12 minutes before a fart ruins the moment and baby’s good mood. 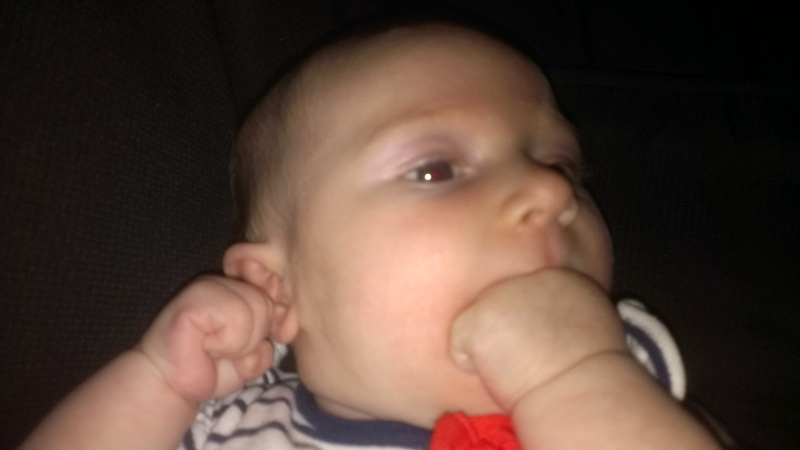 ← Daycare: T-7 days – daddy and baby at work – a running descent into madness?